Watering flowers is my favourite analogy to describing and explaining the importance of ToFu, MoFu & BoFu for lead nurturing. Imagine you own a few pots of flowers, you love them deeply and all you want for them is to grow and flower. All your flowers are beautiful, but so different from each other, they will grow at different speeds and have different needs, so you’ll need to know how much water and sun each one of your flowers needs in order to grow and shine (one way to find out is to actually talk to them, but don’t be disappointed if them won’t talk back…). Now think about your precious leads as your flowers. How do you know what their needs are or what content may answer to those needs? When would it be the right moment for them to find your content and product? But most importantly, how would they feel after consuming your content? Yes, it’s not a quick one! 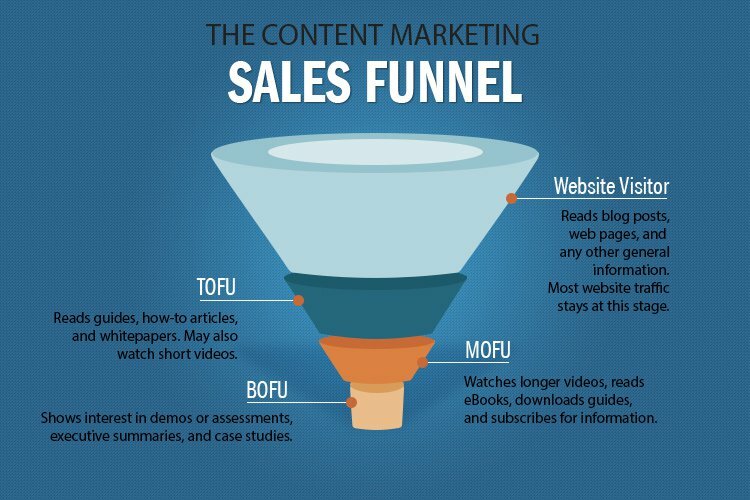 Managing the lead nurturing process is not an easy task, so here come ToFu, MoFu and BoFu to give you a framework aka some watering instructions. The image below summarises nicely the steps and the content to be considered for each stage. There might be leads that go straight from site visitors into customers, but those won’t be many, let’s say those will be your 0,01%. So the show comes to stage when you have to create content that will engage the rest of the leads, content that will convert and make a difference for everyone. You’ll need to think about content that will respond to you leads’ needs, content that will best describe your product, content that will best explain why your product is the solution to their problems. If you already have a product/market fit, it should be easier to get your content to reflect the ways your product can satisfy your targeted market. And although this is the ideal situation, you’ll still need to work hard on identifying the necessary content for your leads, and also work hard on distributing and automating content based on the lifecycle stage your prospects are. The research shows that not everyone who ends up on your website, will ever become your lead or your buyer. Considering that ~85% of your website visitors are top of the funnel and might never come back, it may be a great market research opportunity to capture what your leads are actively looking for and how you can respond better to those needs. Knowing what they were looking for and how they found you may be a good start to creating more relevant and helpful content for those early stages. Similarly, having a middle funnel strategy is crucial because those people are considered good leads, have been engaging with your product for a while and may be considering your solution as a nice to have or even as a must to have! And you should not leave it to the email marketing automation to do all the work, you’ll need to get the conversation started and move them down the funnel. However, for those leads at the bottom of the funnel you may need to carefully consider personalised offerings that would move them faster from consideration to ready to buy stage. Along the way, you need to have set up an automated process in place that would be able to continuously evaluate multiple nurturing campaigns and the conversion of your leads as they move down the funnel, so you make sure that you are watering your flowers accordingly. Develop buyer personas. Learn and get the best insights you can about your leads pain points and the questions they have. Research suggests that free giveaways create a sense of obligation to make a purchase, however, this doesn’t mean that you should offer your expertise free without getting anything in return. Using content to engage and move leads down the funnel should be a two way process: you offer helpful content, but at the same time you need to receive back from them data/intelligence that will make your lead nurturing process more relevant. Use data capturing tools such as: on-site forms and surveys, have a welcoming home gate, pop up windows or slide in a request after a page scrolls, have subscribe box as CTAs, newsletters signups, offers, competitions, etc. Tracking analytics will amplify or kill your lead nurturing efforts. You’ll have to choose and design your own metrics to find out what you need to know about your leads. Remember some channels might be great at generating a great number of site hits but not so good in terms of leads that are interested to buy. Look for visitor -> lead -> customer conversion rate and decide how you are going to assign those conversions to touchpoints in conversion paths. It may be a long route from educating a market to getting those leads to view, asses, consider and buy your product, but if you do love your flowers, you’ll make sure that you learn the ins and outs and make your flowers grow and see them flower.